There may not be a more enigmatic literary character in the horror genre than this sinister chap with royal blood, who just happens to have a thirst for the blood of others. Dracula was Irish author Bram Stoker's Gothic take on vampires. There are suggestions that he was based on Transylvania's Vlad III Dracula of Wallachia. Some scholars, however, claim that Stoker was not familiar with "The Impaler", as Vlad III was known, except for the name Dracula. However he came into being Stoker's Dracula is a charismatic devil, oozing charm and villainy in equal portion. His story is full of elements from mystery to romance, from horror to seduction. He has the power to simultaneously entrance and terrify. Despite the obvious horror his presence evokes there is an element of romance to the story — a man who lures his innocent victims then dispatches them by attacking one of the most vulnerable places on the human body— up close and personal. With the popularity of the Twilight series in modern culture, vampires have indeed become romantic figures. 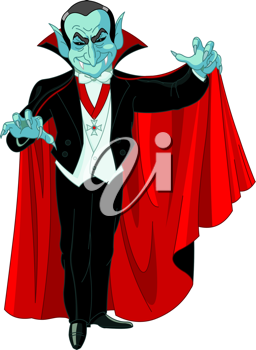 So for our Halloween collection of clipart today we pay tribute to the man who started it all — Dracula.